Under the brand FESTIVAL OF LIGHTS there was not only the festival in the German capital last year. On November 6, 2014, the New York FESTIVAL OF LIGHT kicked off in the Big Apple. The initiators Liam O’Brian and Ira Levy adapted the model of the Berlin FESTIVAL OF LIGHTS to the American metropolis. Liam O’Braion says: “We are very proud to announce our first official sister lighting festival: From Berlin we are building a bridge to New York. The New York FESTIVAL OF LIGHT takes place from the 6th until the 8th of November and in these two places we share a vision of connecting people’s hearts with light, art and love. From Berlin to New York, together we are building a lighting festival family.” Supported were the two from the Berliner team. Birgit Zander, the organizer of the Berlin Festival, is member of the advisory board at the New Yorker pendants. The plan is an exchange about light, projections and mappings – and, naturally, between the artists themselves. 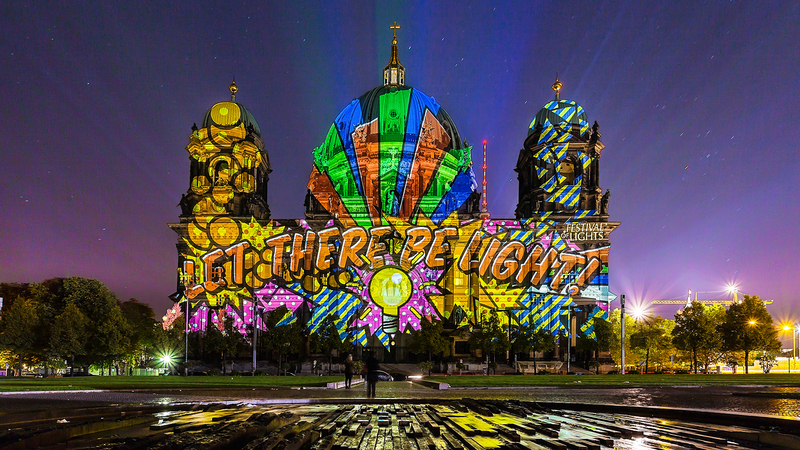 Last year, one artist was present at both festivals: The American Nancy Burson created a design for the Berlin Cathedral Church and later contributed an illumination for the New York FESTIVAL OF LIGHT.